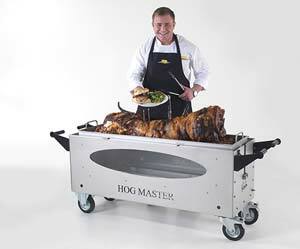 Bea called Hog Roast Bude several weeks ago, in order to hire a hog roast machine for her best friend’s birthday party. She’d been recommended to our catering services by a family member but when she found out we also rent out our own range of equipment, she decided to go for that instead, and host a DIY for the first time ever. Excited but nervous, Bea told us that she was really looking forward to cooking a hog roast herself but asked us for some tips. 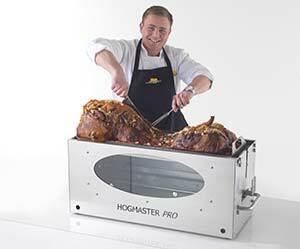 Luckily for Bea, we do much more than that when renting out our hog roast machines. When you hire from us, you get our expertise, knowledge and experience as part and parcel, so we walk you through how to use our equipment in person as well as give you tips on where to get the meat, how to prepare it and so much more. We even drop the machine off at your choice of venue and collect it afterwards too and include a gas bottle, as all our machines are gas-powered. Plus we can provide the meat if you require – the same high-quality, locally-sourced meat that we use when catering, so you know it’ll be just the ticket for what you need. On the day of Bea hiring one of our machines, our Hog Roast Bude chef took it along to her home, where she would be hosting the birthday party in her back garden. She had also asked us to provide a medium-sized hog, as she had heard it would be of great quality and seriously tasty, so our chef took one along too. 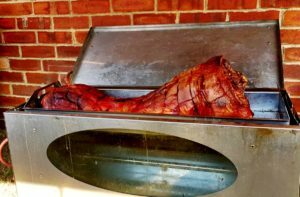 Before long, Bea was well-versed in how to use our hog roast machine to cook the beast, and to be honest, that didn’t take long at all, as they really are so easy to use. Once the meat has been prepared, you set the temperature, turn it on and let the machine do all the hard work while you keep an eye on it. It’s so simple! When our Hog Roast Bude chef collected the machine two days later, Bea was happy to report that her first ever DIY hog roast had been a great success. She didn’t want to let the machine go so we’re sure she will be renting one again soon.